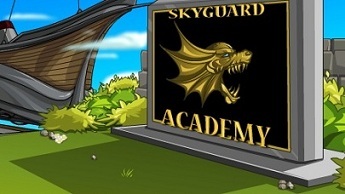 Head to the Academy in our latest update to the member-only Skyguard storyline! Before you arrive, you'll meet the "Master." It's not his real name, but it's the one you'll use if you don't want to relive your nightmares everytime you close your eyes. His only concern is causing Chaos, and he plans to use the Skyguard to do so! He's sure that if he makes enough mayhem, Drakath will be sure to choose him as the next ChaosLord. If you value Stratos' safety and sanity, you'll do everything in your power to stop him! Earlier today, Prince William of Wales married the love of his life, Kate Middleton in Westminster Abbey. We wanted to celebrate the joyous occasion with the happy couple, but we have a release to do! So instead, we've released a shop full of wedding wear that's fit for a Prince or Princess! It's stocked with awesome armors, top-notch top-hats (including the color-custom ULTRAHAT) and millinery masterpieces! To celebrate the Beta release of HeroSmash to ALL players, yesterday we released a shop full of smashin' gear and heroic items! So whether you're a villain at heart or a hero all the time, make sure to peruse the epic weapons and helms we've made for you! You keep coming up with great ideas, so we keep Flashing them! We've got some awesome content updates to our Player Suggestion shop, so be sure to check them out! You'll find armors and weapons aplenty! Most of the team is either heading to or at the Relay for Life event already, so we're going to roll this out, pack up, and go do our part for an awesome cause! Enjoy the release, and we'll see you on Monday! HeroSmash goes live TONIGHT and this is your first chance to become a Founder of HeroSmash! Support this brand new game during the first 30-days of launch with any HeroSmash upgrade or SmashCoin package on this game and you will be declared a Founder of HeroSmash. This is a once-in-a-lifetime opportunity and once it is gone, it will never be available again. Along with the warm & fuzzy feeling that you are making this game possible, you will receive the Founder Badge on your character page, access to the exclusive in-game Founder Shop and other game bonuses, the respect of your fellow players, the eternal thanks of the AE team, and some serious bragging rights. If you missed your chance to become a founder of our previous games (like this one, for example)… do not miss your only opportunity to be a Founder in HeroSmash! Speaking of Founders, AQW Founders get a little perk in HeroSmash. You will get exclusive access to the Drakath HeroSmash Armor. It's just another way for us to say thanks for showing your support for THIS game when it was brand new. We appreciate the faith you have shown in us in the past and we hope you'll stay with us ALL of our new games. Don't forget that Upgrading in EITHER HS or AQW will get you a V.I.P Membership that works in BOTH games, but the ONLY way to get Founder in HeroSmash is by buying a HeroSmash Upgrade or SmashCoins within the next 30 days! 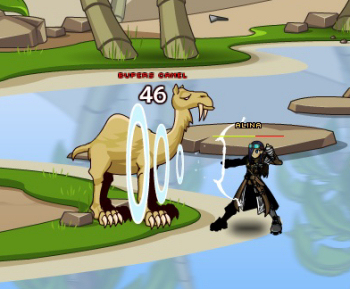 To honor the release of our latest game, AQW has release a small shop with items that you can see soon in HeroSmash! 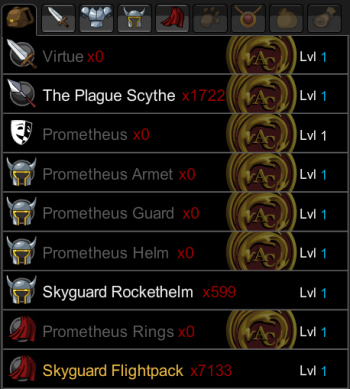 Just click on the HeroSmash button in battleon to browse the items and see what you like. All of these items will be going rare in 1 week. As you probably know by now, William, Prince of Wales and future head of the British Monarchy and his lovely fiance Kate Middleton are getting married tomorrow! 10 Hats to match the Male and female versions of the armor. This also includes 5 top hats one of which is the ULTRAHAT... a top hat so stupidly tall that it goes off the screen in most places in AQW. The ULTRAHAT started as a joke. J6 decided to make each top-hat taller than the others before it. Finally he made one that was about a meter tall and said "why stop there? so he took it to the next logical (illogical) step and thus the ULTRAHAT was born. He sent me the preview and we both got a good laugh out of it. I thought... we should share the laugh. I decided to put this silly hat into the game for the AMAZINGLY DUMB price of 5000 ACs figuring it would just give most people a dumb chuckle. At least those who like to laugh at silly things. We shared this with our Twitter friends and suddenly, against all odds and my explicit request that people NOT waste their money on this hat, people began swearing up and down that they are going to buy it. If you are one of thes people allow me to remind you one last time that this is a terrible idea. It's a stupid hat. It is in NO WAY worth 5000 ACs. Use your money on becoming a HeroSmash Founder or save them for some nice LQS or Quibble item in the future. If you really want the hat (confession, i've done dumb things like that just because I can't resist dumb stuff like this) then I am not the one to stop and I encourage you to take pride in your ownership of the ridiculous spirit that also motivates me to greatness, but I REALLY STRONGLY suggest saving your ACs for something worthy. The hat is still going into the shop and I still hope that most (or all) of you will still get a LOL out of seeing it there, busting out of the preview window. It will be the ONLY AC item in the shop. Everything else is member and non-member gold. Anyway, the Windsor Wedding shop arrives tomorrow and will last one week and we wish Kate and William and long and happy life together! Gratz from the AQW team and everyone here at Artix Entertainment! Tomorrow we continue the Skyguard Member-Only Zone with a trip to the Skyguard Academy where not everything is as it seems. You will also see some great Player Suggestion items making their way from the pages of our forums to the Player Suggestion Shop in Yulgar's inn. Don't forget the Spring Art Content going on now! Read more about it on Beleen's Art Contest-a-licious Post! See you guys tomorrow! Until then, let's all go see what breaks in the HeroSmash launch! Faith is setting up a tent on the track with HeroMart merchandise. 100% of the proceeds will go to the American Cancer Society. If you live in the area, you are welcome to come down and hang out and walk with us. There will be a lot of other teams from other local companies participating too... and hopefully selling lots of hot cocoa to keep us awake all night! The Member-only Skyguard storyline starts this week! The Skyguard are King Alteon's elite aero-martial corps, patrolling the skies and keeping the land clear of do-baders. (Like do-gooders, but... evil.) But what happens when a rogue citizen turns on their country and King? What happens when vendettas grow out of control, when all they see in the forces of good are a means to their own twisted end? You'll find out! Members are invited to journey to the Skyguard Academy this weekend to begin an all-new storyline* full of madness, mayhem, and maybe a little misdirection. Or not. You'll have to play to see! But whatever you expect is going to happen, think again, because the twists and turns in this tale will take you on a ride across Lore and into the depths of a tortured mind! * Storyline will be updated one week a month to let us release other awesome content, too! HeroSmash goes live this Thursday, April 28th, and to celebrate, we're offering a shop full of villainous gear and all the heroic items a good guy could want, and it's all based on the art of HeroSmash! So grab your gold and clutch your ACs, because this gear is SMASHIN'! (That's a good thing.) PS - On Thursday, the Panda Cannon will be moved to some mysterious place in-game. Happy hunting! We've got a rockin' week planned, now all that remains is to get it done! See you on the forums, Twitter, and Facebook! It is officially a hit! On behalf of all of us who put our hearts and soul into the card game, THANK YOU SO MUCH!!! We just heard from our contact at Toys-R-Us (TRU) and... *super smile*... well... they are freaking out that the cards are flying off shelves too fast. In the retail stores (we are just learning about this stuff) it is considered amazing if you sell 10% of the games during the first Month. You guys took out 10% all by yourselves the 1st day O_O. (Note: This is UNHEARD of for an indie company.) When were shocked when players told us that their local TRU stores were already sold out.This card game project was a labor of love -- and if the goal was to get the attention of Toys-R-Us with the hopes of wanting us to do more things in the future... you won! *Dreams of AQWorlds Actionfigures... plastic DoomWeapons... * So, I wanted to find a way to thank you personally. (Other than the CardClasher Class, items, and the bonus surprise House of Cards house.) First I thought of making you a wallpaper, but there is a reason they do not let me draw for the games any more *chuckles*. Then I thought... what could I do that would be special and meaningful that you would enjoy. Then Alina made a suggestion... everyone at the lab nodded, in agreement. Not sure if you have seen the things I have written for AdventureQuest, DragonFable, MechQuest, ArchKnight and AQWorlds before... but I would really like to write the the DoomWood Saga of AQWorlds for you... (of course I always ask for your input and help when I make stuff) and we have a brand new "high energy" band who will be doing a live event during the storyline! Who would like a little... DOOOOOOOOOM!? I Want To Be A HEROSMASH FOUNDER! I've been getting a LOT of mails, Tweets and in-game comments asking how players can become Founders in HeroSmash when it goes live for the first time this Thursday. Some of you are asking "What's a founder?!" or possibly "WatS a F0undr!" so let me tell you. Simply put, a Founder is someone who helps support an AE game (buy purchasing a membership or Coin package) right after it is born to help kick it into high gear and get it moving. It usually comes with some perks like the way that AQW Founders get a new rare pet EVERY YEAR on AQW's birthday for the life of the game. Other perks could pop up at any time. It also comes with crazy "I was there when that game started" bragging rights, and AQW Founders can prove it by showing you the Founder Achievement Badge on their character page. HeroSmash Founders will ALSO get a badge on their HeroSmash character pages proving that they were there. Once 30 days have passed, you will never be able to become a HS Founder ever again! HOW CAN I BECOME A HEROSMASH FOUNDER?! Easy, either become a HeroSmash Member or buy at least $20 USD worth of SmashCoins (like AdventureCoins for HS) within the first 30 days of HeroSmash's online life! I Heard That AQW Members Get A HeroSmash Membership As A Bonus, Is That True? YES! 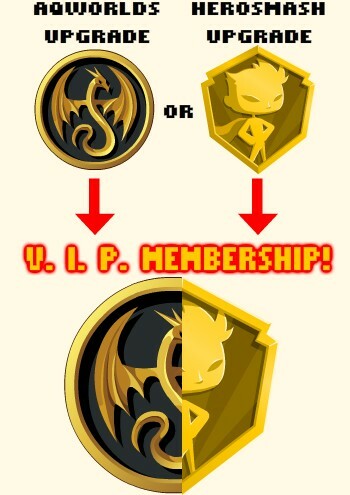 We are calling it the V.I.P (Very Important Player) Membership! It has always and will always be VERY important to us that we give you MORE than what you paid for in all of out games. In that spirit we have tied the AQW and HeroSmash memberships together into this V.I.P Membership that gets you member access to BOTH AQWorlds and HeroSmash! If you're already an AQW member, that means that you are ALSO already a HeroSmash Member! I know it's a little confusing to some people so I made this diagram for you. I'm Already An AQW Member. Does That Mean That I'm Already A HS Member Too?! Yeah, that's exactly what I just said. Literally, it's 5 lines above this line not counting the diagram. Ok... Does That Mean That I'm Already a HeroSmash Founder Too?! No, you are NOT already a HS Founder. If you are already an AQW Member you will be able to enjoy all of the HeroSmash Member benefits like member-only powers, items, areas as well as FUTURE member-only benefits as the game grows BUT In order to become a Founder you MUST either buy $20 USD (or more) worth of SmashCoins OR Upgrade for 3 months (or longer) IN HEROSMASH starting THIS THURSDAY. V.I.P Member Thing Is Kind Of Confusing Too. More Diagrams Plox! Gladly, I can make these things all day long. There are 2 ways to become a V.I.P Member. 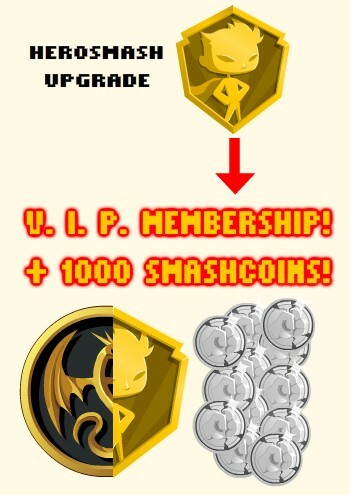 No matter which game you upgrade in, you will be a member in BOTH games but you will only get the ACs if you Upgrade in AQW, and you will ONLY get the SmashCoins if you upgrade in HeroSmash. If you purchase a 3 month membership to AQW, you will be upgraded in BOTH AQW and HS, but you will only get 1000 ACs, (no SmashCoins). On the other hand, If you purchase a 3 month membership to HeroSmash you will be upgraded in BOTH AQW and HS, but you will only get 1000 SmashCoins, (no ACs). I Agree. So When Can I Become A HeroSmash Founder. THURSDAY, April 28th, HeroSmash goes LIVE for EVERYONE! As soon as we are live you will be able to become a Founder, but remember... you only have 30 days from the live release date to become a HeroSmash Founder or you miss out foerver! This chance will never come around again. Unless you've got a time machine. Then, technically, it's YOU who will be coming around again so my original point remains valid. Have You Seen AQW Battle Cards In The Toys R Us Flyers? NO! Do you have a picture, disembodied player voice? Oh Awesome! People must really like the AQW Battle Cards game if it made it into the flyer. Only the big-name stuff gets in the flyer! We really want to thank you guys for making us look good. Several stores across the U.S. have reportedly sold out of the game entirely and more are flying off the shelves every day. I really hope that you think the game is as fun as we do (I am still playing it just about every day with Nursey and my other friends) and hope that you are enjoying the CardClasher Class that comes with it. 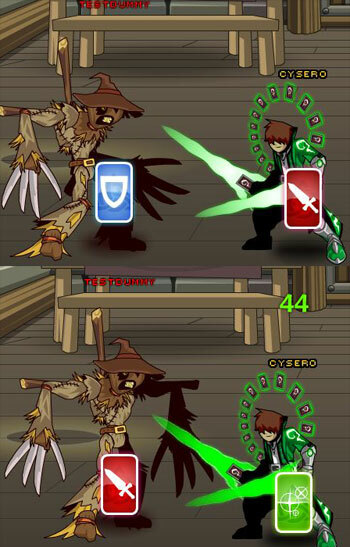 I've gotten some feedback from players who have mastered the class and say that it really is one of the most powerful AND FUN classes in AQW! We still have LOTS more in HeroMart, so feel free to buy some. It would be nice if Faith (Head of HeroMart) could walk around that area of the Secret Underground Lab without swimming through a sea of boxes. I've Already Got My Box Of The AQW ANything-Goes BattleOn Battle Card Game. Ok, so buy one for a friend. Never too early to shop for the holidays, amirite? Who knows, we might be sold out by Frostval! Good Point. I'll Go Buy A Few More. Two Events to Get You Hoppin'! Spring into fun- Grenwog and Earth Day Seasonal Rares! That's right, we've got two egg-citing events- Grenwog and Earth Day- returning, and they're chock-full of cheap Marshmallow Cheep pets, Evolved and Regular Berserker Bunny Armors that will drive you bananas, and a pastel basketful of all your favorite gear from last year's events! Grenwog is an egg-cellent time to go hunting! And once you've collected all those, why not try Cabdury's Treat Hunt to unlock the Evolved Berserker Bunny set? The merge items will drop from the bosses in Greenguard Forest. With an Armor, a Helm, a Spear, and a Long-sword, you'll have a bun-tiful amount of items to choose from! The Evolved Berserker Bunny Armor also requires the drop from the final Vorpal Bunny quest. Berserker Bunny 11 armor, helm, and longsword! Daisy on your back cape! Mayflower and Marshmallow Cheep pets! Fire Egg Staff, Carrotine Cutter, ChickenCow Club! Help the scene become more green this Earth Day! Captain Lore is back again, and it looks like the area is still polluted! Be a hero, join the clean-up crew! With two new quests and a shop FULL of awesome new items, you'll want to reduce, reuse, and recycle as many elementals as you can! Captain Lore's shop will unlock after you do the two new quests. The Fear Chaser event is still available! In the fearsome Fear Chaser event, Ayi Jihu chases down Fears and has asked you to face down Fear Manifestations to save Lore from a terrifying fate! Due to requests made by many enthusiastic fans, the our latest musical event (full of C-major mayhem and frightful foes) will be available to ALL players until next Friday! An all-new, all-game art contest! You guys keep asking for more, so we're starting up a brand-new art contest. Get ready to draw on those art skills and paint the contest thread red! You can submit a piece of artwork in ANY medium and based on ANY of Artix Entertainment's games! (Just make sure your work is original.) More details about the contest can be found on our forum. Be sure to read and follow the rules carefully! 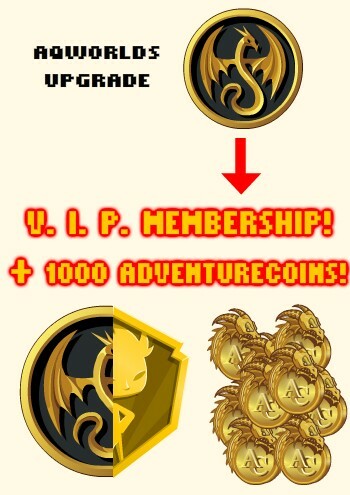 AEXtras is still a great way to get FREE ADVENTURECOINS and even FREE ARTIX POINTS, and with new Inventory, Bank slots and Premiere Event rares to buy there's never been a better time! Or, You can jump onto your Master Account and start earning free Artix Games Points using AExtras and use those Points to get stuff in ANY of our games! Celebrate the end of the World, Sky-NET style! Sky-NET rising, Sky-NET attacking, world ending! Today, April 21st, Skynet achieves self-awareness and starts its all out war on humanity. To celebrate the end of all human life here on EARTH, we have a super-special 24 hour shop in Battleon. It will last until 12:45 pm EST tomorrow. You want to find Skynet? You want to stop Skynet? This is the site to read. A Nifty Offer for Netflix Newbies! Do you like movies and instantly watching your favorite TV shows whenever you want? Interested, US players? Then check out this BRAND-NEW offer from Netflix that you can access through our this page on our Portal site- if you are over 18 (or your parents are agreeable) and have never signed up for Netflix before, we have an offer available where you can get 4,500 Artix Points FREE! * That's enough to upgrade in any of our games! ** However, if you or your parents are like Cysero have already signed up for the service, then be warned- you can't cancel your account and then re-sign up for this one. That's bad ad juju. * BattlePoints have been permanently renamed to "Artix Points". ** Unfortunately, we do not control which areas/countries receive certain offers from our ad sponsors. Spring into GrenWog and Earth Day! With all new items and quests and all of the goodies you loved from last year, this week's release is going to be an eco-friendly, egg-citing treat! 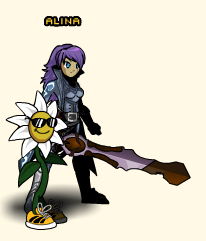 Here's a sneak preview of two of the items going live: the MayFlower pet (a flower wearing a sneaker? That's bloomin' crazy!) and the Bitten Blade! If you're old enough to remember the 90s, you might recall the kitschy dancing sunflower... things. The one I remember had a saxophone and played music. THIS one has a sneaker and- thankfully- won't assault your ears with pop songs. But the above items aren't all we have to offer! Not by a long shot! We've got a world of green goodies and a bunny-tiful amount of spring-themed items for this week's release, so keep an eye on Twitter and the Design Notes for previews! We are going to be on TV! OMG! Attention my fellow AdventureQuest Worlds fans... we are going to be on TV... tonight! If you are in Canada, tune into the show EndGame at 10pm EST on Showcase. AQWorlds will appear in tonight's episodes plotline. Yes, I repeat... this is not a commercial... AQworlds will actually be IN THE SHOW. Crazy!!! The AQW Anything-Goes BattleOn Battle Cards game is now on sale at Toys R Us! Some of you happened to get the CardGame from your local, U.S. Based Toys R Us store this weekend (before they were tsupposed to go on sale) and from what i'm reading on my Twitter, you think this card game is as addictive as I do! This is our first game that is NOT a video game and we're all pretty proud of it. If you are living in the Unites States, you should be bale to find the card game at ANY US Toys R Us location OR on their website. If you are living OUTSIDE of the U.S. (and ONLY outside of the US) you can buy the cardgame NOW at HeroMart! The Color Custom CardClasher Class which comes as a bonus with the card game is LIVE in AQW NOW! If you were one of the lucky few to get the card game early you might have gotten them before the CardClasher Code redemption page was live. If you were having trouble redeeming your code earlier in the weekend, you will find the page is now working! Since the class is now live, let me tell you all about the class's unique skill set! This class is unlike any other in AQW's history. It has the ability to deal cards to you and your opponent and each card has a different effect on each of you! This is the basic fighting skill that ever class has. Nothing fancy about it. 15 Mana. 2 Sec cooldown. Deals a card to you and your opponent. Cards make you stronger and your opponent weaker. Cards have additional effects when Tap is cast. You get three types of cards. A Sword, A Shield and a Spell card. The cards dealt are random, but you can hit Deal again to get different cards. Be careful! Don't spend all of your time and mana looking for just the right cards! 25 Mana. 2 sec cooldown. Tap the cards on you and your target, removing the cards and applying powerful effects. Power is increased by Raise The Stakes stacks, which are consumed. TAPPING THE SWORD CARD: If YOU have the sword card and you use TAP, it will increase damage you do to your foe. If your FOE has the sword card and you use TAP, it will decrease the damage they do to you. TAPPING THE SHIELD CARD: If YOU have the shield card and you use TAP, it will increase your defenses making you take less damage. If your FOE has the shield card and you use TAP, it will decrease the their defenses making them take more damage. TAPPING THE SPELL CARD: If YOU have the spell card and you use TAP, it will apply a decent HoT (Heal over Time) spell to you, restoring a portion of your health for the duration of the spell. If your FOE has the spell card and you use TAP, it will apply a decent DoT (Damage over Time) spell to your for, eating away portion of their health for the duration of the spell. 20 Mana. 2 Sec cooldown. Each cast of this spell makes the effects of Tap and Clash more powerful, but it also hurts you and leaves you more vulnerable. Stacks up to 4 times. Consumed by Tap. Deals damage to your target based on Raise The Stakes stacks, but does not consume them. This power is your mini-nuke, and the best part is that you can still use your stacks of Rasie The Stakes when you Tap the cards you have in play if you time it right, but again... you know what could happen if you bet it all on one big crit. This class is also our first LUCK BASED class, so you will need to visit me in the tub in Yulgar's Inn to gear up! Your CRIT can get pretty high with the ALL LUCK build but try your own builds and see what works best for you! Remember that buying AQW Card Game also earns you the CardClasher Achievement Badge on your character page and in your Book of Lore! You will also find the Secret Bonus Item on the CardClasher Achievement Page now as well! When playing CardClasher, you can totally get by on using nothing more than Draw and Tap, but where's the fun in that?! The whole point of this class is to offer you some risky skills that can GREATLY increase the effectiveness of the skills... or send you crashing to the ground as you bet it all and lose big time. This week is the return of Grenwog, Lore's Spring, Bunny and Egg based holiday! You can expect some great tagged seasonal rares plus a host of NEW great seasonal rares! 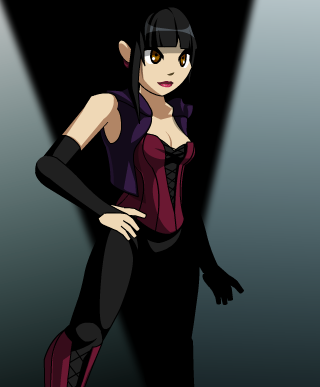 Captain Lore will also be making an underwear-on-the-outside return to AQW as we celebrate Planet Day! Also new seasonal rares there as well! Last but not least, April 21st is a day that everyone knows. It is the day (TV show timeline) that the super-computer Skynet achieves self-awareness and starts its all out war on humanity. To celebrate the end of all human life here on EARTH, we will be having a special 24 hour shop in Battleon. The Shop will ONLY LAST for 24 hours but will be filled with a number of rare theme items that will probably never be seen in AQW again! Liquid Metal (model number: M-1000) moglin pet? Yeah, we're doing that. Cyborg Skeleton Armor? Yeah, we're doing that too. AQW Is Going To Be On TV TONIGHT! Did you see Artix's Earlier Post? If you are in Canada, tune into the show EndGame at 10pm EST on Showcase. AQWorlds will appear in tonight's episode. If you Tweet about the episode, be sure to use the #AQW tag! Let's see if we can make our own #AQW trend! Fear Chaser Event & Event Rare Shop are now open! The Fear Chaser event featuring the music and voice talents of Ayi Jihu, is now LIVE! As usual we Event Rare Shop with TONS of items, several voice-acted cutscenes, an achievement and a bunch of great drops! I should warn you that the Fear Garb is one of the laggiest armors that we've ever created but that is the price for having animated spiders crawling all over your body and in and out of your rib-cage and having animated lava pouring out of your eye sockets! By request, we've increased the room size to 10 to hold more of you and your friends. Ayi asked me to pass on her thanks to everyon who logged in and asked her all of those fantastic questions! You really made her day by just showing up to the event! Remember, once the event closes, it will become Member Only! Members will still be able to get the monster drops and the achievement anytime they like by accessing the event re-run in their Book of Lore but the Event Rare shop closes with the event and takes all of these items with it! To learn more about Ayi Jihu or the Fear Chaser project, check the Fear Chaser event page! 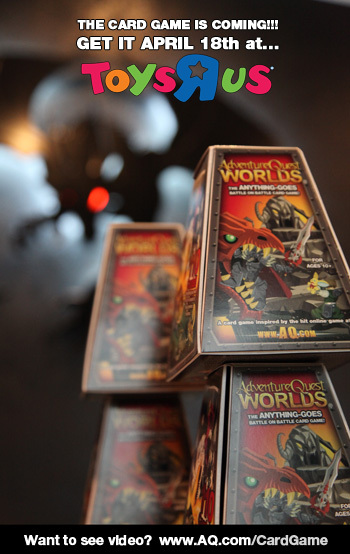 Monday, Arpil 18th, the AQW Anything Goes BattleOn Battle Card Game arrives in U.S. Toys R' Us Stores! it comes with the Color Custom CardClasher Class, Card Cape, Card Blades and we're working on a special bonus item! It also comes with a special achievement badge on your Character Page and inside your Book of Lore! If you live outside the USA, have no fear... the AQW QW Anything Goes BattleOn Battle Card Game will come to HeroMart early next month! Keep your eyes on the Design Notes and we'll give you a date very soon! HeroSmash Founder Coming April 28th! Finally, your chance to become a Founder in HeroSmash! As AQW has AdventureCoins, HeroSmash will have a micro-currency called SmashCoins! To become a founder all you have to do is buy $20 worth of SmashCoins in the first month and bingo... you are a HS Founder! We will be making an announcement about HS Memberships later this month, but for right now all you need to know is $20 or more of SmashCoins ensures that you are a Founder in HS. If you missed out on being an AQW founder, please don't miss this! Or, You can jump onto your Master Account and start earning free BattleOn Games Points using AExtras and use those Points to get stuff in ANY of our games! Tomorrow meet... the Fear Chaser! Ayi Jihu chases fear; she’ll need your help to face the Fears! You fought valiantly (and much faster than we anticipated) in last week’s war against the TerrorKind. But all is not well for the citizens of Lore because tomorrow their masters, the Manifestations of Fear, are out for more than just blood. They want to feed on… your TERROR! But Ayi is here in BattleOn to stop them and she needs your help, Hero! In this week’s all-new musical event starring international pop sensation Ayi Jihu, known to creepy-crawlies, ghosts, and all manner of frightening ghoulies as the Fear Chaser, she will ask you to team up and take on the worst the Manifestations have to offer- themselves! You’ll need to battle through battalions of terrifying TerrorKind (what, you thought you got rid of them all last week? No way!) before you can face off against each of the scarily-ugly and demonically-depraved Fear Manifestations. Vertigo, the Fear of Heights. Nyctox, the Fear of Darkness. Thanatops, the Fear of Death. When we asked you on the forum and Twitter what some of your worst fears were, these three fears kept coming up. So naturally we drew the most boo-tiful art we could think of for them (though it might make you quiver) and placed them in landscapes that will give you the shivers! But if you thought the Creepy Doll head from last week was bad, just wait until you see the big, bad, bogey-boss of THIS week’s event! But you won’t even have to brave the boss battle to access the pre-show shop full of epic AdventureCoin items and gear! Armors, helms, swords and shields, all for the heroes courageous enough to face their fears! That shop will be open to everyone before and during the show, but those items will go rare once the Event is locked for non-members (members will be able to play replay the event and earn the Achievement badge whenever they like)! Get your Game On next Monday! The BattleOn BattleCards are coming to a Toys R Us near you on Monday, April 18th! (That's next week!) With 110 killer cards, you can count on making clever moves to cut your opponent down, but you'd better make your move before they thwart your strategy! 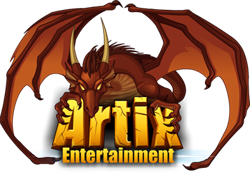 In Artix Entertainment's very first card game, anything can happen and if the situation calls for it, your friends can trap you, steal your armor, toss out your pet, or put skulls on your skulls. (And on fire!) There's even a card for you to draw yourself! Costing $19.95, this massively fun card game will be in Toys R Us stores throughout the nation and will be coming soon to HeroMart (so all you players outside the US can carve out a battle-card empire)! Get all the latest information on the Fear Chaser event page! The path to summer is paved with non-stop adventure! Of course, as you already know... we normally come up with what we are going to make on Monday and our insane team somehow manages to create all of the new things and release every Friday. So the list only highlights the extra special events that we know for sure are coming for you... and there will be A LOT more... it all starts THIS FRIDAY! Thursday April, 28th: HeroSmash BETA and... FOUNDER! May - Friday the 13th with Voltaire in May! May - The DoomWood Saga begins in AQWorlds! Strange Monsters Sighted Marching Toward Battleon! It's that time again! I was out collecting dirt for my dirt collection and I noticed some creatures that look like they've escaped from someone's nightmares. Needless to say I went back to collecting dirt for a few more days then immediatly headed back to Battleon to let everyone know that an army was marching on town. While i was out there I counted heads. It looks like there are about 3 MILLION waves headed this way. 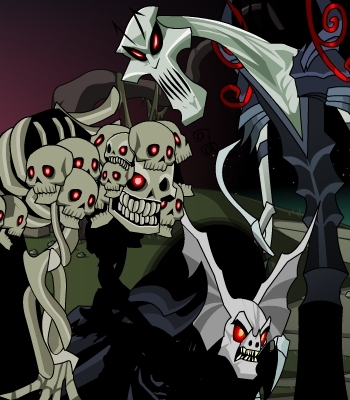 Artix naturally assumed that they were undead. He was so excited that I didn't have the heart to correct him. 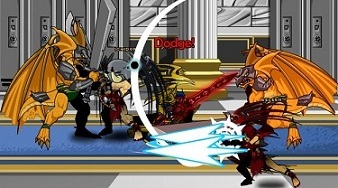 You will find War Rares in the War Chest, but you will need to defend Battleon and earn Fear Trinkets to obtain them. The war will be over next Friday, whether we win or lose it and when the war is over, the items go rare. 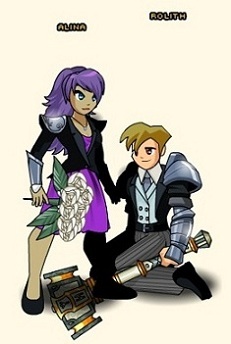 Items like Dage's Knight Terror set. All of this is just a prelude to the Fear Chaser musical Event NEXT FRIDAY. There will be AC Event Rares in the pre-show swag shop during the Event but those items will also go rare once the Event is locked for non-members (members will be able to play replay the event and earn the Achievement badge whenever they like). Rather Massive Suggestion Shop Boost! Another TEN items have been pulled from the pages of our Suggestion Threads on the AQW Forums and added to Yulgar's Player Suggestion Shop! You have probably noticed that we have been getting CRAZY with the Player Suggestion cheeze-whiz lately. I want to thank all of the contributing AQW Artists for helping make some of the players ideas come to life on the screen. Want to see your creation in AQW? Head to the AQW Forums and make a suggestion. 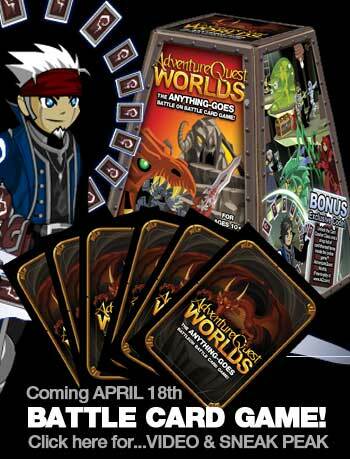 AQWorlds Battleon Battle Card Game Comign April 18th! This week we recieved a TRUCK full of boxes of our Card Game! We had to move all the Ebil Corp Board-Room Skeletons out of the board room to make room for card game storage. I'm totally serious about that last sentence. You guys should pop over to the Battle Card Page and check out the web commercials that Artix and Xyo built while Xyo was visiting the Underground Lab! April 18th - AQW Battle Cards released to EVERY U.S. Toys R Us store. Only stores in the United States will recieve the card game. Early May - HeroMart begins selling AQW Battle Cards to the rest of the world. Check HeroMart.com to see if we deliver to YOUR country! The Card game will cost $19.95 USD (Plus Shipping which depends on where you live) from HeroMart. Toys R Us stores will probably be selling them for close to the same price, but they may mark it up some. We do not control their pricing of the game. AEXtras is still a great way to get FREE ADVENTURECOINS and even FREE BATTLEON POINTS, and with new Inventory, Bank slots and Primere Event rares to buy there's never been a better time! I’ve got the chills in preparation for Friday’s release! A new threat has presented itself to the world of Lore. They are called Terrorkind, a race of monstrous beasts deriving from an unknown dimension... a dimension comprised entirely out of fear! And about 3 million of them are headed THIS WAY! O____O Yikes! Like good ‘ol Cysero said yesterday, you have to defeat waves of monsters in order to raise the War Meter. Once the meter increases by 25%, a new area of the battlefield will unlock. As you progress, you will venture further and further into enemy territory until you reach the Fear Feeder who is behind all these attacks… and only then may we get some answers! But this war is ganna be a bit different. 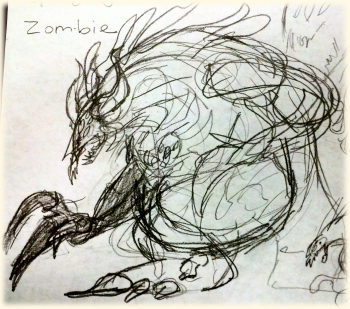 Each monster has a chance to drop up to 5 different Fear Trinkets (name is pending!). And you will be able to use these Trinkets in the War Merge Shop to score some awesome never-before-seen items! 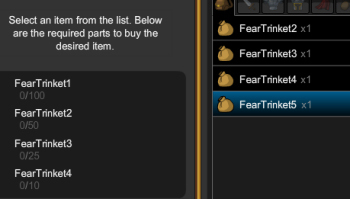 Because we all know how difficult farming for merge items can be, we decided to add a…uh…I don’t know what you would call it…but basically you can use these Trinkets to buy other Trinkets in case you have a bagillion FearTrinkets1 but really need just one more FearTrinket4 to get that epic sword from the merge shop. Wowie! Khuddar the Black Market Dealer in Battleon has nearly SOLD OUT of his epic loot! Just like the name suggests, all the items in his shop are limited in supply. And once they sell out completely… that’s it—no more will EVER be released. So it looks like this might be your last chance to score the remaining items from his shop before it’s too late! Let us hear your ideas on the forums! Almost forgot! Do not worry, we still own the name BattleOn Games and the pre-paid game cards bought in stores that say BattleOn Games will still work with all of the games. As an indie game studio... owned and operated by a team recruited from the growing the playerbase... who builds with your help... we have plans to do some truly amazing things together! WAR is coming to Battleon! It's been quite a while since we've had a war in AQW and it's long past time. 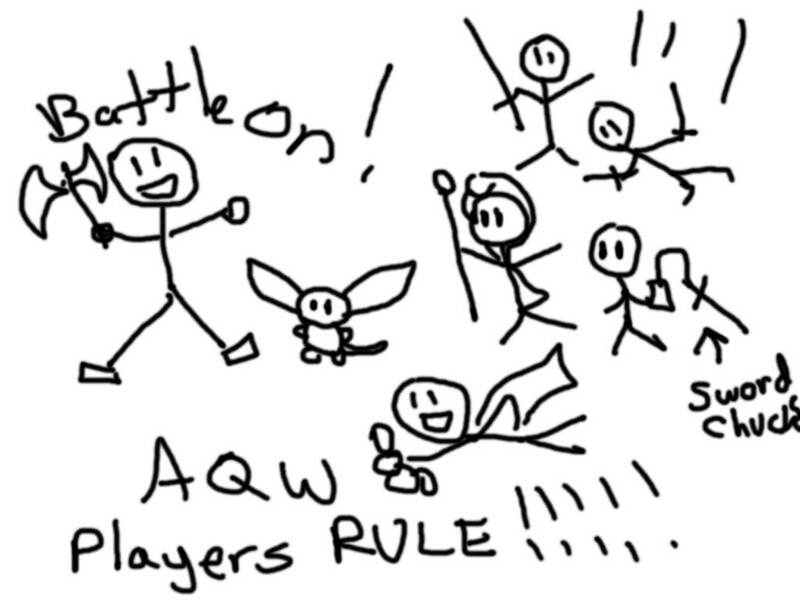 If you have never participated in a war on AQW then here's what you need to know: Everyone fights. Noone quits. If you quit I'll kill you myself. Actually I won't kill you. I won't even toss a clever remark your way and i LOVE doing that. It's just a quote from a movie. There are a set number of foes (which sometimes changes depending on the storyline) and you try to defeat all the waves. As you progress you will venture further and further into enemy territory until you reach the War General who has been sending his troops at you, and usually the reason for the attacks is revealed. This time we will alsi be dropping stackable items that you be able to use in a merge shop to acquire some War Rares, and when you reach the boss there will be MORE rares for you to obtain if you have th guts and stamina. Some people weren't made for war. Some people were born to be farmers. Coincidentally, you warriors will spend a lot of your time farming the war. This war will all be building up to NEXT week's Fear Chaser event! We will also be adding a few new Player Suggestion items to the Player Suggestion shop in Yulgar. Remember that the ONLY way to see your ideas get into game is adding them to the Suggestion Threads on the AQW Forums! Here's a taste of what's to come. This is the Royal Fang Armor and helm suggested by Royal Knight and crafted for AQW by Polistar. The loincloth is color custom to your armor color and the eys match your Accessory color! AQW Anything Goes Battleon Battle Cards! You've already heard all of this if you follow me on Twitter, but this weekend I played took my advance deck of AQW Battle Cards home this weekend to play-test it with Nursey (my wife) and Alces (my best friend). I wanted to know how easy it was to understand for someone who had never seen it before and really didn't have much or any experience with card games. I slaughtered Alces but Nursey took me down. It was her first game EVER and she beat me flat. I couldn't be more proud of my wife. 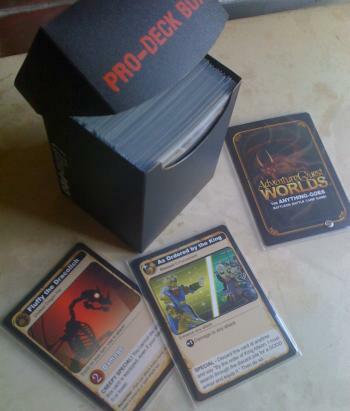 I also went to my local comic shop and purchased some card sleeves for the cards themselves and a deck box (These items do NOT come with the game, nor will we sell them on HeroMart). looks pretty professional if i say so myself. The more I play this game the more fun I have with it. I can't wait to bring it to DragonCon and play some of you guys! Remember, these go on sale APRIL 18th in U.S. Toys R Us stores around the country. If you live outside the US or your local store didn't get any of the game then you will have to way until early May for the cards to be available on HeroMart. We’re not fooling about today’s massive release full of Derps, Huuurrps, Limited Quantity Shop, Steampunks, Ranger Class, Player Suggestion Items, and Skyguards. Herpaderp your way to Battleon by Monday (April 4th) to see the totally derptastic transformed town and score my derpalicious loot! You'll huurp until you can't deeerp anymore! Khuddar the Black Market dealer is back in Battleon! And he’s got some of the coolest (and RAREST!) items ever seen in Lore. This shop was released at 1:00pm EST so if you’re just joining us now… some of the items might already be sold out. It is called a Limited Quantity Shop after all! If you want to get a piece of AQW history, then you better stop reading this and head into game before it’s too late! Stratos, Captain of the Phereless, has pulled into port at the Skyguard's airship docking and refueling station. After exploring the steamy halls of this amazing floating city, why not spend some time aiding the Hover-base's residents? With a stock of steampunk items in the stores and a copious number of quests to complete, you'll be able to begin building your Skyguard Reputation! Rangers are stealthy, wealthy and wise to the ways of their opponents. Able to take down tyrants without blinking an eye or breaking a bowstring, you’ll range far and wide in this armor. And it's NOW available in the Sandsea Rep Shop! When you’ve accumulated Rank 10 in Sandsea Reputation, talk to Zhoom and become the greatest Ranger the world has ever seen! So let us begin the Ranger Class write-up! And as a newfound Ranger, it is important to understand how the Class works. Rangers regain mana when they strike an enemy in combat and when they doge any attack, also restoring some HP. Rangers heavily rely on their Strength, Endurance, and Dexterity stats, so choosing Enhancements that aid these three things will aid you in battle. A great starting Enh would be Thief. Deals light damage and applies Death Mark to your foe. Death Mark can stack up to 5 times unless consumed by a skill or allowed to fade, and reduces foe’s damage up to 5% until consumed. Launches a flaming arrow at your enemy, dealing moderate damage, also burning them with a fire Damage over Time (DoT). Fire damage over time can be increased by Death Mark. This arrow has an explosive tip which explodes on impact, dealing high damage. Nearby foes can also be caught in the explosion for minor damage. Damage increased by Death Mark. Crit chance increased by 8%. You fire a magic arrow inscribed with runes at your target, dealing moderate damage to them but also applying a HoT effect to yourself. Both Damage and Heal Over Time effects are increased by Death Mark. Remember, this Class can only be obtained by those who have their Sandsea Reputation maxed out at Rank 10. If you have already completed the Sandsea saga and still need more Rep… try asking the NPCs in the Oasis and farm those quests! The dailies there award massive amounts of Rep, too! NEW Player Suggestion Shop Items! WOAH! Even more items? And even MORE player suggested items? How wonderful is this? We wish we could put every player-inspired item in Yulgar’s Inn…. but we just don’t have enough artists (unless you want me to DERRRP all of your masterpieces! Ahhaa!) But if you wanna have a chance at seeing your item in game, head to the forums and post your pics there! Tehehe… well it looks like I’ve done my job at “summing” everything up! On behalf of the entire Team, we hope that you enjoy this HUGE release and have a great time playing through the weekend!